Part 1 of the Recording Series which will cover all things recording-related… from recording audition tapes, recording your practice, listening to recordings, and more… stay tuned! Many people have asked me how I create spliced recordings of just the excerpts of whatever pieces are on a repertoire list. (This is one of the checklist items in the Four Stages of Preparation). I'm sure there are many ways to do this, but I use iTunes. Below are the steps I take to splice an excerpt. Without iTunes, this can easily be done with Audacity or other similar programs. If you have other ways of doing this, please leave a comment below! 1. Select the track you wish to take the excerpt from and figure out exactly where the excerpt begins and ends. Write it down if it's easier to remember the timings. 2. Right-click or control-click the track and select "Song Info." 3. 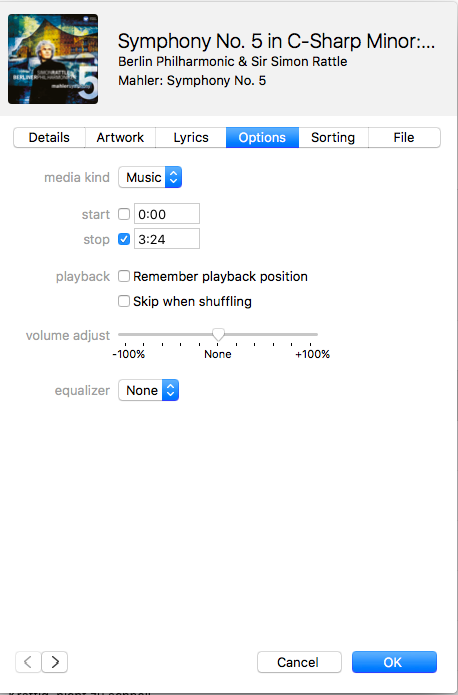 In the Song Info box, select the "Options" tab and check the start and stop tabs. In the start tab, type the start time your excerpt begins at; in the stop tab, type the time your excerpt ends. (Note: It's always best to include a few measures or phrases before the excerpt to help you get into the character). Click OK.
4. At the top left corner, select File > Convert > Create AAC version. This will make a duplicate copy of the track, but only from the start and stop times you specified. The copy will have the same title and likely show up in same the album or folder as the original track, it will just have a much shorter duration. I like to immediately rename the duplicate track, "Audition Edit: piece/excerpt," and move it to a playlist of spliced audition edits. 5. Be sure to undo the durational parameters you set for the original track. All you have to do is go back into the same Song Info/Options menu from above, and uncheck both boxes. It is important to remember this step. That's it! You're done! An audition playlist with spliced excerpts or "audition edits"
A folder of many spliced excerpts or "audition edits," organized by composer.